The best way for you to judge the difference we can make in the health of your mouth and the beauty of your smile is to show you. The following photographs are from the portfolio of Dr. Harvey Simon, covering a variety of different dental conditions. Take a look at the before-and-after photographs and see the difference we can make for you. Notice they are presented with a retracted lip view to provide close up detail of the tooth / gum junction. Success in this area is vital to a healthy, long term result. This 30-year-old was dissatisfied with the appearance of her upper front teeth. They were stained and out of proper alignment. 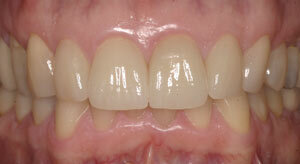 We used six porcelain crowns to both create a renewed healthy appearance and achieve the proper alignment of her teeth. This patient came to us 15 years after receiving poorly fabricated veneers on her two front teeth. The veneers were poorly proportioned with an improper height-to-width ratio. In addition, the patient's lateral incisors were chipped. Using properly proportioned porcelain crowns, we artfully restored her four upper front teeth (incisors) and made a dramatic difference in the beauty and natural look of her smile. Chemical erosion resulted in loss of tooth structure affecting both cosmetics and function for this 28 year old women. Careful planning as well as meticulous management of the surrounding gum tissue provided this beautiful result. This 70-year-old patient was unhappy with her worn, sensitive and dark lower front teeth. She suffered from occlusal dysfunction and receding gums, and there was an unsightly gap at the gum line. Using six porcelain crowns and creating a healthy gum line with no gap, we restored the natural beauty of her smile and the functionality of her bite. This example illustrates a complex full upper arch restoration for a patient with no remaining healthy teeth. Following intense planning, utilizing Cat Scan imaging, 8 implants were placed to support a fixed (non-removable) upper prosthesis. This is a sophisticated alternative to a complete denture. Years of neglect had left this 55-year-old patient with missing teeth, advanced decay and significant cosmetic issues. We designed a complex plan of restoration for the lower arch. Porcelain crowns were used selectively in the front, gold crowns in the back. Together they provided support for a removable partial denture. This option was less costly than implants but still provided a remarkable transformation. This is an example of non-removable tooth replacement for a patient with severe bone loss on the upper arch. Implants were not an option due to the extent of bone loss. Therefore, a fixed bridge with tissue colored porcelain was provided on the upper. Lowers shown are temporaries.